Punjabi is Indo-Aryan language of the Punjab in India and Pakistan. Punjabi is spoken by peole of many religions including mainly followers of Islam, Sikhism and Hinduism. Punjabi has has over 125 million native speakers, which makes it the 10th most widely spoken language in the world. Punjabi has about 30 million speakers in India and more than 60 million in Pakistan. Almost half the population of Pakistan speaks Punjabi. Punjabi is the Provincial language of the Pakistani Province of Punjab. Punjabi is spoken as first language by 3% of Indians, esp. the followers of Sikhism. Punjabi is the official language of the Indian state of Punjab also. Punjabi is one of the official second languages of the states of Delhi and Haryana and Punjab and Haryana's capital Chandigarh. Punjabi developed as an independent language in the 11th century. the literary tradition in Punjabi started in times of Baba Farid Jee. The early Punjabi literature was principally religious or spiritual in nature. Modern Punjabi language is facing many threats. Its being projected as the language of the Sikhs (especially in Indian Punjab) In Pakistani Punjab its struggling against Urdu as educated class of society is abandoning Punjabi. Punjabi is spoken as a minority language in many other countries where Punjabis have settled in large numbers. Punjabi is the 2nd most common language in the UK and 4th most common spoken language in Canada. Large number of Punjabi speaking population also exists in countries like United Arab Emerates, United States, Saudi Arabia, Hongkong, France and Australia. Punjabi is most commonly written in the Gurmukhi script - especially in Indian Punjab - which is the most complete and accurate way to represent Punjabi sounds. Unlike Roman script, the Gurmukhi script follows a ‘one sound-one symbol’ principle. Shahmukhi script is also used to write Punjabi - mainly in Pakistan. Shahmukhi is a local variant of the Arabic script based on the Nasta'liq style of the Persian script and has traditionally been used by the Punjabi Muslims. It is the official script and format for writing the Punjabi language in Pakistan. The map of Punjab is wrong. It should include Haryana and Himachal from India. Indian government oppressed Punjabis and snached Haryana & Himachal Region from Punjab in late 50's. But it still is Punjab. I TOTALLY AGREE WITH JaggaJatt ji. 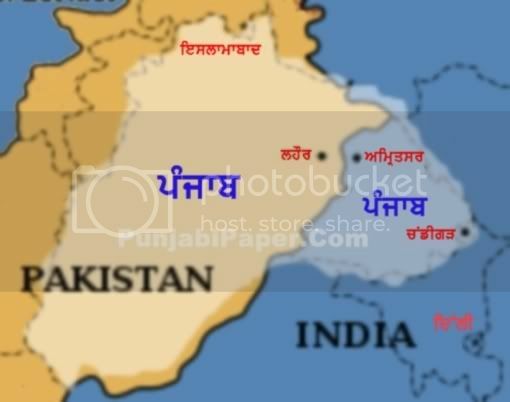 I keep searching the actual map of Punjab, I am not able to find it!? It is so sad that the Indian government wants to completely pull out roots of the truth. The map looks OK. It is showing present Punjab. The dotted lines show Haryana & Himachal which at present not in Punjab. I think Pakistsni Punjab is the same before & after partition. Bebe Main Sant Banuga. Its a good business. Panjabi or Punjabi? How do spell ਪੰਜਾਬੀ ? I would rather say 2'nd and 4th Copy paste job not so well done. Copy paste job not so well done. Video of Nagar Kirtan in Abbotsford BC.